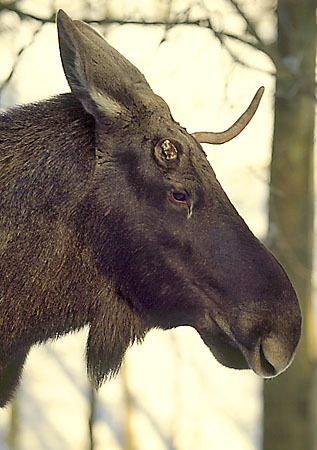 The antlers, which only bull moose have, can reach 36 kg (Alaskan moose) and can have up to 15 ends and span up to 2,2m! Compared to their body weight the antlers are still modest. The antler size varies, depending on the habitat: Alaskan moose have the biggest antlers with 23kg in average, the Canadian ones 20kg, the more southerly ones in North America moose around 16kg in average, while the European moose only bring around 10kg to the scales. 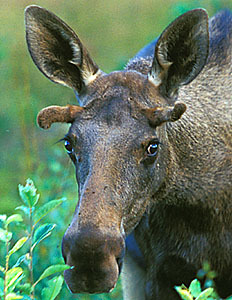 The size is of course depending on age and nutrition, but shows a regional variation as well: In America the smallest antlers can be found in Yellowstone (Shiras Moose) via the Eastern and Northwestern Moose with approximately 140cm antler spread up to the Alaskan moose with the largest antlers as indicated above. Antlers are - at the period of growth - covered with a soft skin called velvet, which is highly supplied with blood and very sensitive due to lots of nerves. This sensibility reminds the bull to avoid any contact during the antler growth period, which could result in a severe damage of the evolving antlers, leading to an unsymmetry. The velvet enables the fast growth of the antlers and is shed in late August / early September, when the blood circulation into this skin is switched off. Consequently the surface dries and the skin starts falling off. Subsequently the bull uses e.g. trees and shrubs to scrape of the dead velvet from his antlers. This happens just before the rut and takes only a few days. After the velvet is removed the antlers are bone-white. Their more brown color is deriving from their frequent contact to shrubs. Antlers are able to absorb the shocks from amting fights to a certain degree by means of a softer, spongy core. The complete antlers of older bulls are flinged off/casted after mating season when the testoteron level drops, so every year around mid December. Seldomly one can find those antlers, as mice, squirrels ... eat them up completely to get the contained minerals. Young males keep their antlers longer until February, yearlings even up to March. Prime bulls are the first ones to cast their antlers, likely as they also were the first and most successful ones during the rut and their testosterone level therefore also declines first. Just before antlers are casted, their rudiments seem to itch: The bulls rub them againts trees. Both antlers halfs might drop synchronously, or with a time-lag of several days. New antlers start growing again in late March/April, where hormons are produced triggered by the increases amount of of sunshine. The antler starts from a cartilage close above the eyes (pedicles), which then mineralizes to bones within five months. In late May the velvet-covered antlers can already be recognized again. The maximum size is reached in mid August to September. In spring/summer new antlers can grow up to 19mm PER DAY! In not even half a year moose can grow 20kg of antlers. Antlers growth requires a lot of nutrients, such as proteins, calcium and phosphorus. Building of antlers seems to require as many resources as it takes the cow to develop a calv! Antlers reach peak sizes with 6-10 years of age. The bull moose uses his antlers in first instance to impress females and rivals (similarities in behaviour to other species are pure coincidence!) and show he is interesting breeding stock - and to deter other male moose from coming too close to "his" cows during the fall mating season. The antlers are also said to amplify sounds - helping to better locate cows in mating season. Not before the mating season it becomes really hot in the forests, but then an unknown aggressivity emerges in moose country. Bulls start trashing antlers against shrubbery and trees to attract (audible) attention - the size of the antlers is reflcted in the evolving sounds and is therefore also a status symbol. If other bull moose don't grudge the chosen cows - the antlers are used for visual threating signals - a "bull moose shows" so to say, a symbol of dominance. The bulls "swing their antlers" tilting their heads from side to side with ears down and intermediately stroke the shrubs with them. Usually the older bulls with larger antlers win without fight just by showing them after a few minutes, reducing risk for both sides. If this doesn't help, a battle might emerge. After circulating around each other the bulls push their antlers against the rival. In that setup they show their power and perserverance and push themselves around. This type of fighting usually takes some 30 minutes, but may also last for hours and in worst case, e.g. if the antlers of both bulls get locked, can cause death (in mentioned case by starvation, if the antlers can't be disentangled). Other injuries usually don't get critical due to the very thick skin around the neck in this season (up to 2 cm). 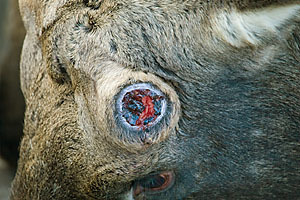 Anyhow bulls might have up to 50 puncture wounds from other bulls antlers after the rut. In only 3% of the fights dangerous injuries occur. Before the real fights for the cows start, many bull moose start a training between friends: Sparring between bulls with clarified role allocation (i.e. the dominance is clear) is common. Real fighting is ways more dangerous, intense and violent than this sparring, then leading to wounds. This fighting in the mating season is very energy consuming and causes heavy loss of weight (bulls hardly eat during the rut), which could get dangerous in the coming winter season, where energy reserves might be required. Looking at antlers' outlook one finds two different kinds: The palmated ones (see drawings) with similarity to bowls and the non-palmanted ones with rods. 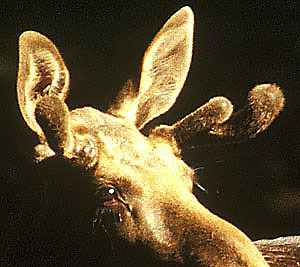 Which type of antlers a moose has depends on the habitat more than on sub-species. In Southern distributions the non-palmated antlers are dominant, the more North you look the more palmated ones occur.